When you are close to breaking point and are feeling completely overwhelmed by the multitude of stressors in your life and tips like deep-breathing or meditation just don’t seem to be enough to alleviate the stress, the thought that comes to mind is “How will these help?“ Remember that these techniques WILL work once you change the way you look at your stressors. Think about this: Why does a situation that causes you an immense amount of stress cause little or no stress to another person? It all comes down to the way you think about a situation, the way you perceive the stressor. Stress is actually caused by an interaction between the situation you are in and your perception of the situation. Changing the way you THINK of, or PERCEIVE that situation, therefore, will help you actually change the way you experience stress. If you think of stressors as all-encompassing and threatening, you will see no escape from them and be overwhelmed by them. But if you perceive the situation as “challenging” and believe that there IS a way to deal with it, you will feel less overwhelmed by it and look at it as a situation that can be remedied. Once you have adopted a positive outlook, deciding that the stressors that you are facing CAN be dealt with, this helps you see that small steps that can lead to bigger changes. Viewing circumstances in an optimistic light will help you adopt a greater sense of hope, encouraging you to deal with the situation, rather than stress about it. 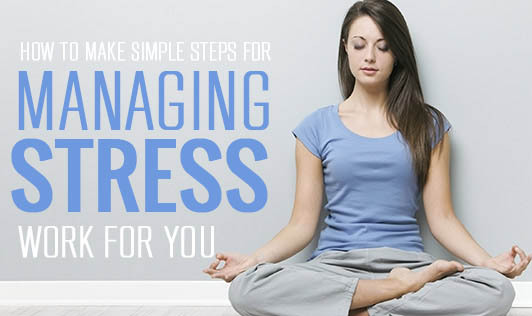 Breathing exercises or simply taking a walk can help you feel less weighed down, giving you a chance to think calmly and find ways to deal with the stressor. Taking a break to read something funny/light or simply sharing a joke with a colleague will bring relief with laughter, helping you dissipate the built up tension. Exercising daily also helps reduce stress, getting you ready to face the stressors coming your way. So start changing the way you think and you will eventually begin to see the difference!